Gifts to employees are a traditional way to thank people important to your business, but the IRS says certain types of gifts are taxable, and making sure you follow the rules can avoid a spoiler later. 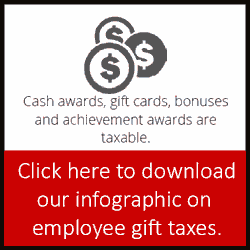 The good news is all gifts and awards to employees are deductible expenses for employers. All cash or gift cards redeemable for cash are taxable to the employee, even when given as a holiday gift. Likewise, monetary prizes, including achievement awards, as well as non-monetary bonuses like vacation trips awarded for meeting sales goals, are taxable compensation – not just for income taxes, but also for FICA. Withholding applies. 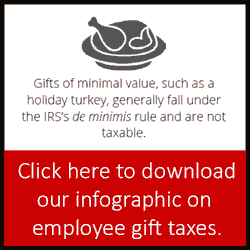 On the other hand, non-cash gifts of minimal value, such as a holiday turkey, mostly are not taxable for employees if they are under $75 per year. Gifts worth more than $75 are taxable. 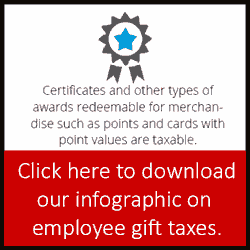 Gifts awarded for length of service or safety achievement are not taxable, so long as they are not cash, gift certificates or points redeemable for merchandise. The tax-free value is, however, limited to $1,600 for all awards to one employee in a year. 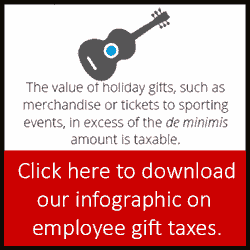 For more specific details on employee gifts, read "Spread cheer with holiday gifts, but beware the IRS." Organizations may find that individuals or groups who benefit from the organization’s services, desire to make year-end gifts to the organization’s employees for their loyal service. Examples include the parents of private school students providing year-end gifts to their children’s teachers or a hospital patient’s desire to financially thank the medical team that provided excellent care for the patient. While we all would like the ability to just graciously give or accept gifts from the heart without worrying about tax consequences, many questions arise regarding the tax consequences of such gifts. Those include the status of a charitable contribution deduction for the individuals involved and the taxability of the cash received by the employee. Much depends on the process chosen for the gift giving. Gifts given to the employer organization for distribution to the employees, either from such a fund or from the individuals. While individuals would enjoy a tax deductible charitable contribution for the gift and the employees would prefer the gift to be nontaxable to them, this sort of “double dipping” is usually not the outcome. First, let’s look at Scenario #1 – the individuals provide the gifts directly to the employees. It probably is no surprise that in this scenario there would be no charitable deduction to the individuals. The question that frequently arises in this situation is whether the gift is taxable income to the employees or mere nontaxable gifts. To constitute a gift for purposes of federal tax law, a transfer of money or property must be made out of a feeling of disinterested generosity. The payment must be in the nature of “something for nothing.” It is not a gift if the payment is a reward for services rendered. With regard to payments made by an individual to a service provider, it is difficult to argue that such payments constitute gifts, even when the amounts are paid at the holidays. In addition, it is more difficult to make that argument when payments made by individuals are pooled together and allocated to service providers based on the number of hours that each provider worked in a given time period, or some other metric that is related to the provider's employment. The individual giver has the right to determine who receives the payment. Such tips also are subject to income tax withholding and with some exceptions, FICA withholding. Tips under $20 in any one month or noncash tips are not subject to FICA although they are subject to income tax. If an employee receives more than $20 of tips in any month, then the employee should report the receipt of the tips to the employer so that the employer can withhold the proper amount and report the tips as other wages and tips on the employee’s Form W-2. The withholding is taken from the wages of the employee (other than tips) or from other funds made available by the employee for this purpose. If the employee does not report the tips to the employer, the employee still is responsible for paying income tax and the employee portion of FICA. In such a case, the employer portion of FICA only would be payable when the employer receives a written notice and demand from the IRS. It may be prudent for the employer to have policies and procedures in place for employee reporting of tips to the employer. Next, let’s look at Scenario #2 – the individuals create a fund into which they contribute cash and payments are made directly from the fund to the employees. This fund can either be just a collection of cash or a separate legal entity. If the gifts are provided from a fund that is not a separate legal entity, then the gifts are in essence coming directly from the individuals to the employees as discussed in Scenario #1. The more controversial question is, if the fund is facilitated through a separate 501(c)(3) tax exempt entity, can the contribution to this exempt entity for gifts to employees be a tax deductible contribution? The answer to this depends on whether the entity is acting merely as an agent for the individuals or if the entity has control of the funds and can spend it as it wishes. Whether or not the entity is acting merely as an agent is a question of facts and circumstances. Do the individuals have control of the entity’s actions in the transaction? Is there a written agreement obligating the entity with respect to the transaction? Is the entity holding itself out as an agent of the individuals for this transaction? If the gifts are earmarked for the employees and the entity does not have the authority to spend the money in any way it deems fit, then the entity should be viewed as an agent acting on behalf of the individuals, and the conclusion is the same as Scenario #1. If the entity has full control and discretion as to the use of the funds, then the gift should be deemed a contribution to the tax exempt entity and thus a charitable deduction should be allowable. In that case appropriate acknowledgments of the charitable contributions should be given to the individual contributors. The tax treatment of the gift to the employee from the entity would have to be analyzed in accordance with the definitions discussed in Scenario #1 to determine whether it is a tip or a gift. Scenario #3 places the charitable organization that employs the service providers in the place of the fund discussed in Scenario #2. In this scenario, the charitable organization receives the contributions directly from the individuals and in turn provides the payments to its employees. The analysis of this scenario is much the same as scenario #2. Tips not only include amounts received directly from individuals, but also amounts paid to the employee by the employer on behalf of these individuals. Thus if the charitable organization is acting as an agent for the individuals, then the conclusion is the same as scenario #1; specifically, no charitable deduction for the individuals and likely taxable tip income to the employees. If the charitable organization has full control and discretion over the funds and thus can spend it in any way it decides, then there should be a charitable contribution on the part of the individuals. However, the income should still be taxable to the employee, but in this case as regular wages rather than tip income and should be treated as such in the employer’s accounting and payroll reporting. Thus, in none of these scenarios does the employee receive tax free income, unless the gift is in no way connected to the services they provide, which is a difficult position to take even in scenarios #1 and #2, and nearly impossible when payment is made directly from the employer. Therefore, employers should encourage employees to report tips to the employer if the amount of the tip is at least $20 in any month and the employer should report the tips on the W-2 and withhold the proper amount. Whatever scenario best fits your organization’s practices, be sure to provide proper donor acknowledgments for charitable contributions and proper employee records and tax withholding for tips or wages. As a first step, decide which scenario best fits the organization’s desires going forward, regardless of how these gifts have been handled in the past. Then speak to your tax advisor about proper reporting and structuring for the chosen scenario in future years and how to handle any required reporting for potential past errors.